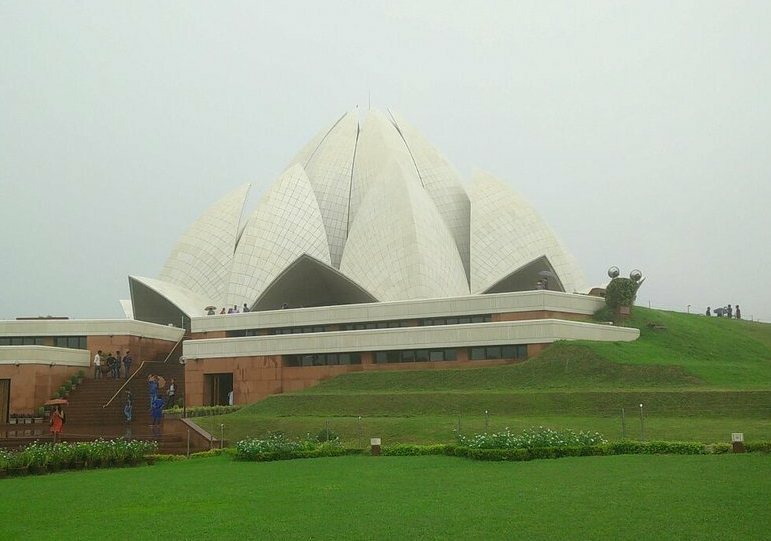 Lotus Temple is a Bahá’í worship temple is located in Kalkaji, New Delhi. It is seventh and last temple of Bahai around the world. Lotus flower like shape temple’s construction was completed in 1986. It is unique type of worship house open for all people of every religion. The Lotus temple has nine pools of water and nine entry gates, which connect to the central hall. 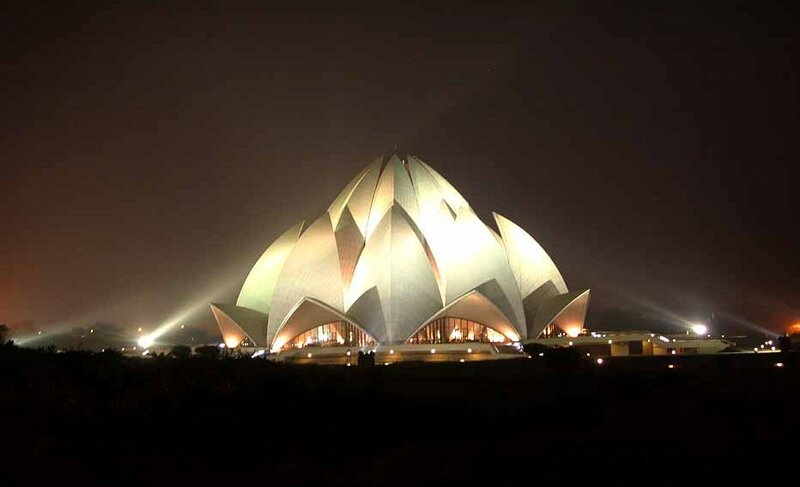 Lotus temple is inspired by the design of lotus flower and 27 marble petals completed the shape of a lotus flower. The height of the central hall is 42 meters and it can accommodate 2500 visitors. Delhi Iskcon Temple is located just under 1 KM near the Lotus temple. Check Lotu temple delhi timings and entry fee along with address and nearest metro station to reach here easily. It was opened for visitors in 24 December 1986 and diameter of temple is around 70 meters. The main architect of the temple is Fariborz Sahba and construction was done by Flint & Neill firm of UK. The seating capacity of lotus temple is 1300 and 2500 people can accommodate easily in the hall. The Bahai temple of worship is situated in the middle of the lush green lawns. 9 water ponds near the 9 entry gates of central hall give a spectacular view to the temple. An information Centre is also located in the complex with a visitor’s gallery with 3 auditoriums. The seating capacity of the main auditorium is 400 and another two auditoriums can accommodate 70 people. The Lotus temple has a cloakroom and shoe deposit room where people can deposit their shoes and footwear before entering into the temple. Two daily films are also running in the information centre in Hindi and English. Hindi film (Jewel in the Lotus (Kamal Mani)) show times are 10.30 AM to 5.30 PM in every half an hour and English movie (Light of Unity) time is 10.30 AM to 5.30 PM in every 20 minutes. Lotus temple is most visited religious building in the world; it witnesses 8000 to 10000 visitors every day and it is more crowded on Saturday, Sunday and holiday time. Summers of Delhi are very hot, so the afternoon visit to the temple should be avoided in the summer season. Winter and rainy seasons are more comfortable to visit the temple. Lotus temple is located near Nehru Place near Kalkaji. Lotus Temple nearest metro station is Kalkaji Metro station. It is just 500 meters away from the temple. New Delhi Railway station is 13 kilometers far from the lotus temple and Indira Gandhi International airport is 20 KM away from the station. Parking facility is available at Lotus temple and Shri Kalkaji Mandir is also a must visit place if you are planning to visit the Bahá’í worship temple. Kalkaji Mandir to lotus temple distance is just 600 M (10 Minute Walk). Lotus temple timings are 9 AM to 7 PM in summers and 9 AM to 5.30 AM in the winter; however, entry closed at 5 PM in winter and 6.30 PM in summer. Information Centre visiting hours are 9 AM to 6.45 PM in summers and 9 AM to 5.15 PM in summers. There is no entry fee in Bahai Temple, hence entry ticket is free. Photography is allowed inside the complex; however, prior permission is required to click pictures in the central hall. It is a worship house so taking a camera and clicking a picture in the central hall is not allowed. Bahai Temple remains closed on Monday. Lotus temple looks fascinating in the night under the lights, however, entry in the night is allowed. Still, you can view the temple at night from some nearby higher places like Metro stations or buildings.